I was in Salt Lake City for the holidays, and attended my old ward on New Year's Eve, The downtown Canyon Road Ward in the Ensign Stake. A friend was speaking on hope. She told a story about Spencer W. Kimball, who, at age 70, was in terrible health and was not expected to live two months longer. He brought his doctors to his meeting with the Quorum of the Twelve, and after explaining he was a "dying man" he had the MDs give their reports on his prognosis. 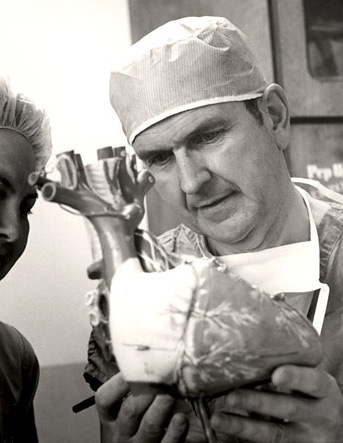 Russell M. Nelson was his heart specialist at the time. He reported that there were surgeries for Elder Kimball's issues, but due to his condition, he could not recommend these stressful procedures, he didn't think the patient could survive them. In essence, this was Elder Kimball's farewell to the brethren. Harold B. Lee would not hear of it. He pounded his fist on the table and exclaimed SPENCER!!! Something to the effect that his mission was not finished and he needed to proceed with the surgery. In the face of current wisdom to the contrary, he was directed to have HOPE! The rest, is history! To me, this was an introduction of Russell M. Nelson to the upper echelons of the church leadership. And once there, he was selected by then President Spencer W. Kimball, to fill a year and a half vacancy in the Quorum of the Twelve created by the death of LeGrand Richards. Dallin H. Oaks was sustained at the same time to fill the opening made by the death of Mark E. Peterson, but was not ordained till the following month due to his judicial assignments. Conference after conference, I noted that the years may have been rolling by, but Russell M. Nelson hardly aged. That is, until the death of Boyd K. Packer. I believe he has felt the weight of his pending call ever since, and it has been difficult for him to bear. But, though he may not feel prepared, he HAS BEEN PREPARED for such a time as this! Unlike many of the prior prophets, Russell M. Nelson has had a career that has garnered him national and international recognition. His credentials and life experience will matter, along with all other preparations, at this critical time in the history of the world when so much has changed so quickly to undermine the family and religious liberty. When the divisiveness in this nation and in the world has reached unprecedented levels. Forward thinking, clear-minded, articulate, yet sensitive, aware and loving, as well as decisive, this is the day for President Russell M. Nelson to wear the mantel of the prophet and president of The Church of Jesus Christ of Latter-day Saints. His second wife, Wendy L Watson, was never married before their marriage in 2006. Having experienced single life and a professional career as a professor of marriage and family therapy in the School of Family Life at Brigham Young University, as well as author and public speaker, up to that point, Wendy is a very different role model for LDS women than previous wives of prophets. She is very comfortable in front of large groups and a camera. This, too, I think is very important for President Nelson as well as the role she will specifically play now. President Nelson has 9 daughters! Yes! I think he is and will be very keen to the issues of women. I learned from a friend that he is aware of difficulties existing in the personnel at church headquarters that are not in keeping with the example of Jesus Christ, and I have felt for some time that this issue is most definitely keeping us from attaining to a Zion society, required for the return of the Savior. He knows that the world is plenty wicked to qualify for the conditions just prior to the second coming, the problem is, the church is not righteous enough. I hope under his administration that will improve significantly! I am excited for the many recent changes in church curriculum and policy in many areas, and look forward to many more. They may not all be easy, but they will be inspired. If we cannot go willingly and by free choice, we may end up going by calamity.